"Devagiri" redirects here. For the hill in Odisha, see Devagiri hill. Daulatabad, also known as Devagiri, is a 14th-century fort city in Maharashtra state of India, about 16 kilometres (9.9 mi) northwest of Aurangabad. The place was originally named Devagiri  when it was an important uplands city along caravan routes (ca. sixth century AD), but the intervening centuries have reduced it to a village. However it is also considered to be one of the seven wonders of Maharashtra and a developing tourist spot. The historical triangular fort of Daulatabad was built by first Yadava king Bhillama V in 1187. Starting 1327, it famously remained the capital of Tughlaq dynasty, under Muhammad bin Tughluq (r. 1325-1351), who also changed its name, and forcibly moved the entire population of Delhi for two years before it was abandoned for lack of water and Tughluq was constantly known to shift the capital from Delhi to Daulatabad and Daulatabad to Delhi. There is a belief that Devagiri was built in 1203 AD by a Dhangar or herdsman who acquired vast wealth by his good fortune. He had a brother who was a shepherd named 'Raja Ram' and in correlation with it he assumed the rank of a Raja (King). Lord Shiva is believed to have been stayed on the hills surrounding this region. Hence the fort was originally known as Devagiri, literally (Hills of Gods). Devagiri-Daulatabad Fort -- Devagiri (Deogiri). The area of the city the hill-fortress of Devagiri (sometimes Latinised to Deogiri). It stands on a conical hill, about 200 meters high. Much of the lower slopes of the hill has been cut away by Yadava dynasty rulers to leave 50 meter vertical sides to improve defenses. The fort is a place of extraordinary strength. The only means of access to the summit is by a narrow bridge, with passage for not more than two people abreast, and a long gallery, excavated in the rock, which has for the most part a very gradual upward slope. About midway along this gallery, the access gallery has steep stairs, the top of which is covered by a grating destined in time of war to form the hearth of a huge fire kept burning by the garrison above. At the summit, and at intervals on the slope, are specimens of massive old cannon facing out over the surrounding countryside. Also at the mid way, there is a cave entrance meant to confuse the enemies. No separate exit from the fort, only one entrance/exit - This is designed to confuse the enemy soldiers to drive deep into the fort in search of an exit, at their own peril. No parallel gates - This is designed to break the momentum of the invading army. Also, the flag mast is on the left hill, which the enemy will try to capitulate, thus will always turn left. But the real gates of the fort are on the right & the false ones on the left, thus confusing the enemy. Spikes on the gates - In the era before gunpowder, intoxicated elephants were used as a battering ram to break open the gates. The presence of spikes ensured that the elephants died of injury. Complex arrangement of entryways, curved walls, false doors - Designed to confuse the enemy, false, but well-designed gates on the left side lured the enemy soldiers in & trapped them inside, eventually feeding them to crocodiles. The hill is shaped like a smooth tortoise back - this prevented the use of mountain lizards as climbers, because they cannot stick to it. Devagiri (190 57’ N; 750 15’ E) is located at a distance of 15 km northwest of Aurangabad, the district headquarters and midway to Ellora group of caves. The original widespread capital city is now mostly unoccupied and has been reduced to a village. Much of its survival depends on the tourists to the old city and the adjacent fort. The Mughal Army captures Devagiri. Capture of Devagiri Fort in 1633. The site had been occupied since at least 100 BCE, and now has remains of Hindu & Buddhist temples similar to those at Ajanta and Ellora. The city is said to have been founded c. 1187 by Bhillama V, a Yadava prince who renounced his allegiance to the Chalukyas and established the power of the Yadava dynasty in the west. During the rule of the Yadava king Ramachandra, Alauddin Khalji of Delhi Sultanate raided Devagiri in 1296, forcing the Yadavas to pay a hefty tribute. When the tribute payments stopped, Alauddin sent a second expedition to Devagiri in 1308, forcing Ramachandra to become his vassal. In 1328, Muhammad bin Tughluq of Delhi Sultanate transferred the capital of his kingdom to Devagiri, and renamed it Daulatabad. Some scholars ague that the idea behind transferring the capital was rational, because it lay more or less in the centre of the kingdom, and geographically secured the capital from the north-west frontier attacks. In the Daulatabad fort, he found the area arid & dry. Hence he built a huge reservoir for water storage & connected it with a far-away river. He used siphon system to fill up the reservoir. However, his capital-shift strategy failed miserably due to lack of application & other factors. Hence he shifted back to Delhi & earned him the moniker "Mad King". The next important event in the Daulatabad fort time-line was the construction of the Chand Minar by the Bahmani ruler Hasan Gangu Bahmani, also known as Ala-ud-Din Bahman Shah (r. 3 August 1347 – 11 February 1358). Hasan Gangu built the Chand Minar as a replica of the Qutb Minar of Delhi, of which he was a great fan of. He employed Iranian architects to built the Minar who used Lapis Lazuli & Red Ochre for coloring. Currently, the Minar is out of bounds for the tourists, because of a suicide case. As we move further into the fort, we can see the Chini Mahal, a VIP prison built by Aurangzeb. In this prison, he kept Abul Hasan Tana Shah of the Qutb Shahi Dynasty of Hyderabad. The antecedents of Abul Hasan Tana Shah, the last Qutub Shahi king are shrouded in mystery. Although a kinsman of the Golconda royals, he spent his formative years as a disciple of renowned Sufi saint Shah Raju Qattal, leading a spartan existence away from the pomp and grandeur of royalty. Shah Raziuddin Hussaini, popularly known as Shah Raju, was held in high esteem by both the nobility and commoners of Hyderabad. Abdullah Qutub Shah, the seventh king of Golconda was among his most ardent devotees. He died in prison leaving no male heir to the throne. In this Chini Mahal, Sambhaji maharaj, son of Shivaji maharaj was kept. Most of the present-day fortification was constructed under the Bahmanis and the Nizam Shahs of Ahmadnagar. The Mughal Governor of the Deccan under Shah Jahan, captured the fortress in 1632 and imprisoned the Nizam Shahi prince Husain Shah. The outer wall, 2.75 miles (4.43 km) in circumference, once enclosed the ancient city of Devagiri and between this and the base of the upper fort are three lines of defences. Along with the fortifications, Devagiri contains several notable monuments, of which the chief are the Chand Minar and the Chini Mahal. The Chand Minar is a tower 210 ft (64 m). high and 70 ft (21 m). in circumference at the base, and was originally covered with beautiful Persian glazed tiles. It was erected in 1445 by Ala-ud-din Bahmani to commemorate his capture of the fort. The Chini Mahal (literally: China Palace), is the ruin of a building once of great beauty. In it Abul Hasan Tana Shah, the last of the Qutb Shahi kings of Golconda, was imprisoned by Aurangzeb in 1687. Devagiri is in the outskirts of Aurangabad, and is on the Aurangabad - Ellora road (National Highway 2003). 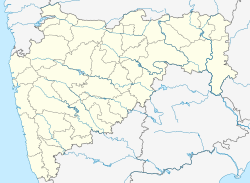 Aurangabad is well connected by road and 20 km away from Devagiri. ^ Sohoni, Pushkar (2015). Aurangabad with Daulatabad, Khuldabad and Ahmadnagar. Mumbai: Jaico. ISBN 9788184957020. ^ "Devagiri-Daulatabad Fort". Maharashtra Tourism Development Corporation. Maharashtra, India. Retrieved 12 May 2015. ^ "मध्यकालीन भारत में सबसे ताकतवर था दौलताबाद किला" [Madhyakālīn Bhārat Mēṁ Sabsē Tākatavar Thā Daulatābād Kilā]. Aaj Tak (in Hindi). India. 22 August 2012. Retrieved 16 November 2018. ^ "देवगिरी – दौलताबाद" [Dēvagirī - Daulatābād]. www.majhapaper.com (in Marathi). Maharashtra. 9 September 2012. Retrieved 16 November 2018. ^ Gopal, Madan (1990). K.S. Gautam (ed.). India through the ages. Publication Division, Ministry of Information and Broadcasting, Government of India. p. 174. ^ "ऑक्टोबरपासून हॉट बलून सफारी" [Octoberpāsūn Hot Balloon Safari]. Maharashtra Times (in Marathi). Khultabad. 25 May 2015. Retrieved 5 June 2015. ^ Neha Madaan (22 March 2015). "Virtual walks through tourist spots may be a reality". The Times of India. Pune. Retrieved 16 November 2018. ^ "स्वरध्यास फाउंडेशनच्या कलावंतांनी स्वच्छ केला दौलताबाद किल्ला" [Svaradhyās Foundationcyā Kalāvantānnī Svacch Kēlā Daulatābād Killā]. Divya Marathi. Aurangabad. 18 November 2014. Retrieved 5 June 2015. ^ Bajwa, Jagir Singh; Kaur, Ravinder (2007). Tourism Management. APH Publishing. p. 249. ISBN 9788131300473. Retrieved 3 July 2016. ^ The Asiatic journal and monthly register for British and foreign India, pg 355. Published in 1827. ^ Gopal, Madan (1990). K.S. Gautam (ed.). India through the ages. Publication Division, Ministry of Information and Broadcasting, Government of India. p. 176. One or more of the preceding sentences incorporates text from a publication now in the public domain: Chisholm, Hugh, ed. (1911). "Daulatabad" . Encyclopædia Britannica. 7 (11th ed.). Cambridge University Press. pp. 848–849. ^ a b Qureshi, Dulari (2004). Fort of Daulatabad. New Delhi: Bharatiya Kala Prakashan. ISBN 978-81-8090-072-3. Retrieved 7 March 2010. ^ Kishori Saran Lal (1950). History of the Khaljis (1290-1320). Allahabad: The Indian Press. pp. 55–57. OCLC 685167335. ^ Banarsi Prasad Saksena (1992). "The Khaljis: Alauddin Khalji". In Mohammad Habib and Khaliq Ahmad Nizami (ed.). A Comprehensive History of India: The Delhi Sultanat (A.D. 1206-1526). 5 (Second ed.). The Indian History Congress / People's Publishing House. pp. 192–193. OCLC 31870180. ^ Sohoni, Pushkar (2015). Aurangabad with Daulatabad, Khuldabad and Ahmadnagar. Mumbai ; London: Jaico Publishing House ; Deccan Heritage Foundation. ISBN 9788184957020. ^ Sen, Sailendra (2013). A Textbook of Medieval Indian History. Primus Books. p. 170. ISBN 978-9-38060-734-4. ^ "अभेद्य थी दौलताबाद किले की सुरक्षा" [Abhēdya Thī Daulatābād Kilē Kī Surakṣā]. www.prabhasakshi.com (in Marathi). New Delhi. 22 May 2012. Retrieved 11 August 2015. Wikimedia Commons has media related to Daulatabad, Maharashtra.